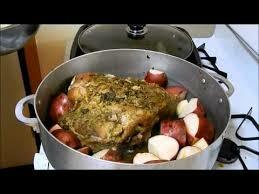 Pernil al Caldero al Estilo de Epi - Epi's Pork Pot Roast - Tienditadepuertorico.com - Buy Puertorican Food Here!! 1 Remove any excess fat and skin from the meat. Make small cuts all over. Wash dry. cover it with plastic wrap. Refrigerate for 2 hours. stock. Cook, covered, over medium low heat for 3 hours. Add more liquid if necessary.